Near the beginning of 2017, my wife and I made the decision to become cord cutters. After years of paying a cable bill every month and seeing those costs rise, we decided to take the leap. After all, we have Netflix, HBO Now and Amazon Prime TV, more than enough content. Additionally, for those of you who don’t know, I live in Wisconsin and the Bears don’t regularly appear on my cable programming. For me, watching the game every week means traveling to a friend’s house or going to Buffalo Wild Wings. So, with all those things considered, we decided to take the plunge. Now you are probably wondering why I spent the first paragraph detailing my entertainment consumption decisions. Fair point. 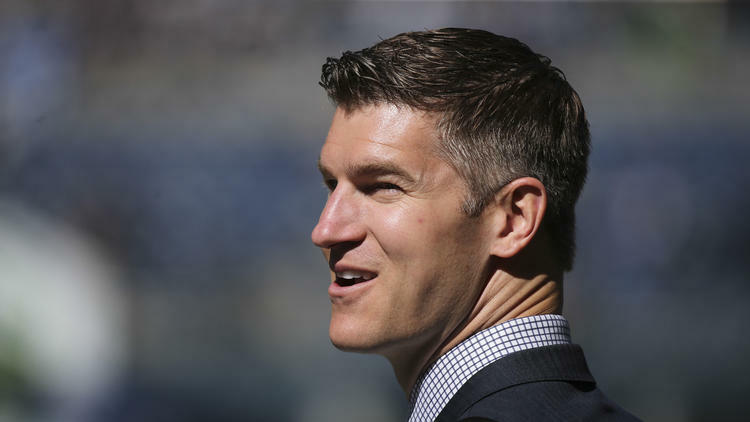 It’s because I want us to travel back to draft night so I can talk about what will ultimately define Ryan Pace’s career and impact all of our Sundays for years to come. My wife was out to dinner with a former colleague and I was figuring out where I wanted to go to watch the draft live. Typically, I go to Buffalo Wild Wings but tonight was a special night, I decided I wanted to go to a place where I can eat taco’s and drink a few Modelo’s. I called up one of the local Mexican restaurants and asked if the draft would be on their TV’s and the host told me if I asked upon arriving that would be fine. However, upon arriving the bartender told me no. Too many people were there to watch a baseball game and they weren’t willing to change one of the three TV’s there. While I was pissed, there wasn’t much time to spare, I rushed over to Buffalo Wild Wings. Upon arriving, I came to the terrible realization that there were no more seats available. What a nightmare. I decided I wasn’t going to spend the next few hours standing. I had been looking forward to this for far too long. I decided to make one more trip to a brand new Mexican restaurant that had opened up nearby. Luckily, I went there and was able to get a seat at the bar. There was nobody there to watch the draft and it ended up being just me in my corner drinking Modelo and eating a Torta. I ended up getting my drink right before the draft started. I figured I had time to relax. Myles Garrett would go one, but the Bears don’t pick until 3 which should give me plenty. As all of you know, that’s not exactly how it went. When the Bears traded up I had goosebumps on my arm. What is going I thought to myself. My ideal scenario was the Bears trading back, acquiring more picks and being able to get their next signal caller mid first round. I don’t know how long it was from the time they announced the Bears had traded up to the time they call Mitch Trubisky’s name, but it felt like forever. The moment came, Trubisky’s name was called and in that moment, Ryan Pace forever tied himself to Mitchell Trubisky. Twitter exploded, the analysts analyzed, the takes were hot and the Bears made a franchise altering decision. I watched the rest of the draft but it was hard to focus on anything else that was taking place. Pace had made his decision and he took the leap. It seemed like nobody saw this coming. That was the point. I spent the next few days reconciling the decision in my head. I hadn’t seen Trubisky linked to the Bears at all. I consumed articles and videos almost hourly in the weeks leading up to the draft. While the Bears were still playing regular season football I was reading mock drafts on who the Bears would take and who could help them take the next step. I read player profile after player profile. I watched programming, profiling the top end of the draft class. It never really occurred to me that the Bears would draft Trubisky. In hindsight, it’s easy to see that was by design. Pace had made his decision early on and spared no expense disguising his interest. You and I had no idea that it was going to be Trubisky because Pace didn’t want us to. Not us specifically, but everyone. Pace’s entire professional career had built to that point and it was the most important decision he has ever made. When that is the case, you do everything possible to stack the deck in your favor. I spent the next few weeks hearing from every person who could form an opinion explain why they knew more about football than Pace. I mean, they didn’t phrase it like that but that’s essentially what they are saying. I heard that the 49ers weren’t taking Trubisky and the Bears traded up for nothing. I heard the Bears traded way too much to move up one spot. I heard that the Bears got fleeced by master tactician and draft wizard John Lynch. Ultimately, I ended up reaching a different conclusion. All of those people were morons. Look, just because the 49ers weren’t taking Trubisky doesn’t mean they weren’t open to trading with someone who would have moved in front of the Bears to take him. As fans, we see a fraction of what goes on behind the scenes. The people making those assumptions were doing so with no information. Did the Bears trade too much? Also, stupid. If Trubisky ends up being who Pace thinks he is going to be, there is no price too high. If he ends being Brees or Manning or Wilson, I would be ok with Pace giving up the next decade of 3rd round picks. If he ends up being the caliber of one of those quarterbacks, it will be the Bears who did the fleecing. But what if he is not? That’s a fair question. All my above arguments assume that he can become great. It’s possible that Trubisky never reaches the level Pace envisions him playing at. That possibility exists for every draft pick. However, this is the risk you absolutely must take. In all of sports, there isn’t a risk more necessary or more impactful. There isn’t a position in team sports that impacts a franchise more than QB. It’s the hardest position to play and it’s most important. The Bears could have gone Adams or Thomas and that probably would have been pretty exciting. The Bears defense looks pretty damn solid and adding a piece like makes them even more formidable. But at the end of the day, does that matter? The answer is no. Look at the last 15 Superbowl winners. Who were the quarterbacks? I bet you can name them relatively easily. Ok, try again but this time name the Free Safety on that team … I’ll wait … I love when the Bears have a vicious defense as much as the next fan but we aren’t winning anything if you don’t address the most important position on the field. The last argument I heard as to why Pace is bad at football decision making is that we signed Mike Glennon and drafted Trubisky. “I can’t believe you guys spent 45 million on a QB and used your second pick on a QB”. If you find yourself having this argument with someone on twitter, do yourself a favor and block them. You will live longer. First of all, if you have an important decision to make and you are able to give yourself two chances to get it right, do it. Secondly, if you are taking the time to read this piece, 1300 words in, you know the cap implications that make this a relatively safe gamble. Guarantee money is this year, blah, blah, blah. But contracts and money aside, what we have here is a Quarterback eager to prove he can play in this league with the crystal clear understanding that this is his year to do that and the top QB taken in this year’s draft. We have a plan and one that happens to make a lot of sense. At the most important position in football, we have done everything we can do to position ourselves for success. So, with training camp imminent, I am as excited as I can ever remember being for the start of football. A roster that was once bereft of talent is starting to take shape and we can look forward to several exciting position battles. Pace might have found us an electric change of pace running back, the safety of the future and a total stud tight end that will cause nightmares for defensive coordinators for the next decade. However, at the end of the day, none of it will matter if he didn’t hit on this years first pick. If Trubisky ends up being who he thinks he is, the rest of that will simply be icing on the cake. In his third draft Pace finally pushed all his chips to the center of the table. When the dust settles he will either be a genius with the conviction to get his man, or another name Bears fans curse as we bemoan the futility of our favorite franchise. Either way, I am at peace with the decision and thrilled that we took the risk. In football, you either have a QB or you are going to be on the outside looking in. This years draft, Pace took the only gamble that really matters. Your article reflects all my FB trash talks sites comments ! i AGREE ! – Great Article !! I don’t think I am smarter than Pace but I still must go back to his first year and first draft. He should have taken Beasley. I was so pissed off when he took White. From the time the Jets went on the clock I went from the ecstasy of thinking, we would be drafting Leonard Williams then back happy that we will still get Beasley to WTF. I admit to having a different perspective on the so called skill position (WR) value. Great QB’s make great WR’s it doesn’t work the other way around. Jeffery, Marshall, Bennett could not make Cutler great while a great QB can win with a stable of good WR’s. One only needs to look at the Patriots for evidence of this. They don’t have a true number one receiver but have a stable of good ones. I will go even further than most on this QB situation. If the Bears have another year that puts them in a position to acquire another top OB in the first round that Pace feels is the best QB in the draft then he should draft him. It is the one position a team should swing for the fences every single year till they find the QB they are looking for. However my version of which QB was the right one last year for the Bears is different from Pace but as you said in your article, we are working with less information. But for the Bears, I saw Mahomes as the QB most likely to be a franchise changing top QB. That said I am on board with Trubiski. He is more athletic and we he lacks in arm strength compared to Mahomes he may make up for decision making, at least early on.